DULUTH, Ga. - Jordan Hall scored five times and added three assists to lead the Georgia Swarm past the Saskatchewan Rush 18-14 on Sunday in Game 1 of the National Lacrosse League final. Georgia will take its 1-0 lead in the best-of-three Champion's Cup series to Saskatoon on Saturday. 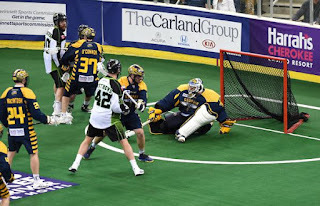 Kiel Matisz had a hat trick and two assists for the Swarm, while Miles Thompson, Shayne Jackson, Randy Staats and Johnny Powless had two goals apiece. Lyle Thompson had a goal and set up four others, while Bryan Cole added a single. Mike Poulin made 36 saves for the win. Mark Matthews led Saskatchewan with three goals and four assists, while Jeremy Thompson and Adam Jones each had a hat trick. Robert Church struck twice and added five assists and Curtis Knight added a pair of goals. Ryan Keenan also found the back of the net. Aaron Bold stopped 36 shots in net. Georgia did not score on its two power plays and the Rush went 4 for 4 with the man advantage.